Volunteers are needed for Wilderness First Aid scenario sessions that provide realistic practice in smart decision making for wilderness emergency situations. July 9, Sept. 17 and Nov 7. We're seeking volunteers to serve as victims for our First Aid Scenario Sessions in Renton on July 9, Sept 17, and Nov 7. This is a great way to brush up on your own first aid skills, flex your acting chops, and help our students graduate! 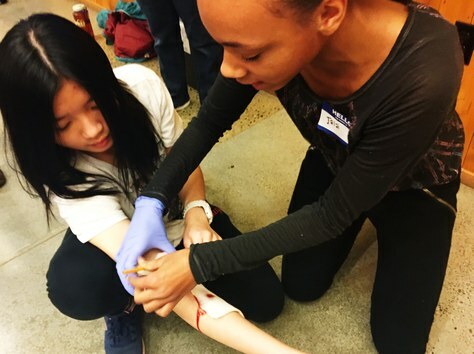 Please sign up to be a patient or evaluator You'll help our students practice the first aid and emergency response skills they learned in class. We need volunteers for our scenario sessions on July 9, Sept 17, and Nov 7. The volunteers fo rthe July 9 scenario can learn to apply moulage (accident makeup) from Mary Panza of the Seattle Branch who is wiling to share her know-how. These will be hosted at the Lake Desire Community Center in Renton from 6pm-9pm. Patients require no prior experience, just a willingness to wear accident makeup and follow a simple script. Evaluators should have advanced first aid skills, i.e. WRFA, EMT, RN or MD and have wilderness experience. Please let the scenario leader know you want to be an evaluator. We have two Wilderness First Aid (WFA) classes now open for registration on September 8/9 and November 3/4. Sign up!